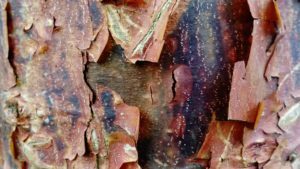 Acer griseum is commonly known as the Paper Bark Maple due to its attractive peeling bark, which is a rich orangey brown. In the Japanese bed, we have three of these stunning trees planted together. On winter days, when the sunshine hits the peeling bark, it almost looks like the trees are on fire. Acer griseum is also a superb tree for a small garden as it doesn’t grow very big and can be sourced as a multi-stemmed tree for added effect from a specialist nursery.